Here is another plant that has anti cancer effects to add to our steadily increasing arsenal of plant based curatives. The problem of course for most victims, by the time you discover the problem, the horse is running and catching it from a cold start is well nigh impossible from a cold start. This pretty well drives drastic intervention which usually ends up as a stop gap that also weakens the individual. However we will add it to our list of good foods and recall that switching to a pure vegan diet immediately is strongly indicated. This makes the system alkaline as does strong doses of baking soda. Thus adding in additional cancer fighting plants ups the assault on the cancer. Never getting the disease is still the best cure but unlikely in our world for most. By the time you pay attention you are already a captive audience. I’ve finally replanted all the cerasee in my yard. If you remember, I wrote to you recently about how this healing vine used to grow along my fence. Until my neighbor read that it was a weed and he killed it all with Roundup. True, it’s not very well known in the West. Apparently not even by the botanists at the University of Florida where my neighbor got his information. But this lime-green vine that grows wild in Jamaica, and now at my house again, deserves more respect. Especially since it fights cancer. The Jamaicans who eat the reddish-orange fruit and its seeds are known for their iron-hard bones and incredible health. My friend Ivey Harris, the last living descendant of the 500-year tradition of Maroon herbalists in Jamaica, tells me that they’ve been making tea and tonics from the leaves for centuries. 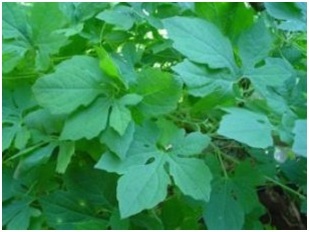 They use it to cure rashes, stomach pain and diabetes. Cerasee, or bitter melon, has so many healing properties that researchers brought it to the University of Miami to study it. They discovered that an enzyme in the ripe fruit can inhibit growth of cancer cells. One of the ways it works is by increasing “apoptosis-inducing factor” or AIF inside the cancer cells. This stops the cancer cells from making energy, and tells them to shut down and die off. The leaves are also an excellent choice for skin problems. Researchers have discovered that cerasee interferes with an enzyme that’s been linked to psoriasis. Ivey tells me that for many skin problems, or even just to have naturally healthier and cleaner skin, they crush cerasee leaves and add them to their baths. The Maroon healers traditionally use cerasee for diabetes – although they didn’t understand the causes or progression of the disease. Still, they made a good choice, because cerasee contains a compound that helps normalize blood sugar5 – a major problem for diabetics. When I traveled to India I found bitter melon there, too. Although Ayurvedic medicine, the oldest system of medicine in the world, calls it karela. I always have faith that something works when I see the same tradition of use spring up in totally unrelated places around the world. Ayurveda treats diabetes with it as well. And like the Maroon tradition from thousands of miles away, having had no contact with each other, both cultures use cerasee to help strengthen eyesight. Turns out it has the nutrients lutein and zeaxanthin which both improve eyesight. The fruit looks a bit different in India, with pointier ends, and they use it in their cooking when it’s still green. I sometimes use cerasee in my cooking, too. I cut the green fruit open lengthwise without peeling. Then I remove the seeds and the unripened fruit from inside and chop it like a green pepper. Then I boil them until the pieces are tender, and add them to my stir-fry. Are Black Pumas Giant Sloths? What Do Ants Know That We Don’t? The Day the Earth Exploded? Ebu Gogo: The Flores Hobbit?